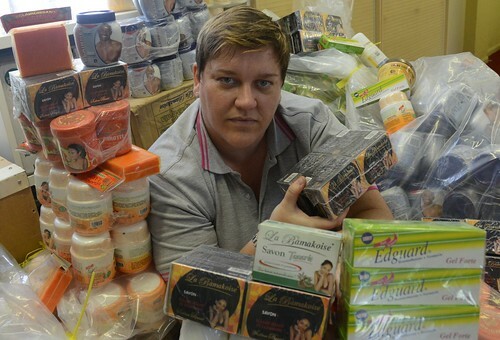 Surrey County Council trading standards officer Claire Hodgson with the illegal cosmetics haul. Click on picture to download. Potentially life-threatening cosmetics have been seized by Surrey County Council as part of one of the UK’s largest-ever hauls of its kind. The 752-kilo cargo taken by trading standards officers at Heathrow Airport includes more than 1,000 cosmetic items, from creams to lotions, containing a skin bleaching ingredient – hydroquinone – that is banned in the EU because it increases users’ risk of getting cancer and liver conditions. The rest of the 3,000-item seizure, which came from the Ivory Coast, was also impounded because the products contained prescription medicines or were wrongly labelled. The 752-kilo haul is due to be destroyed within the next month. Surrey County Council trading standards officers have been inspecting goods arriving at Heathrow since 2009 under a regional scheme that ensures banned goods are seized at customs before they reach hundreds of retailers nationwide. The council also recently seized a similar 600-kilo batch at Heathrow.